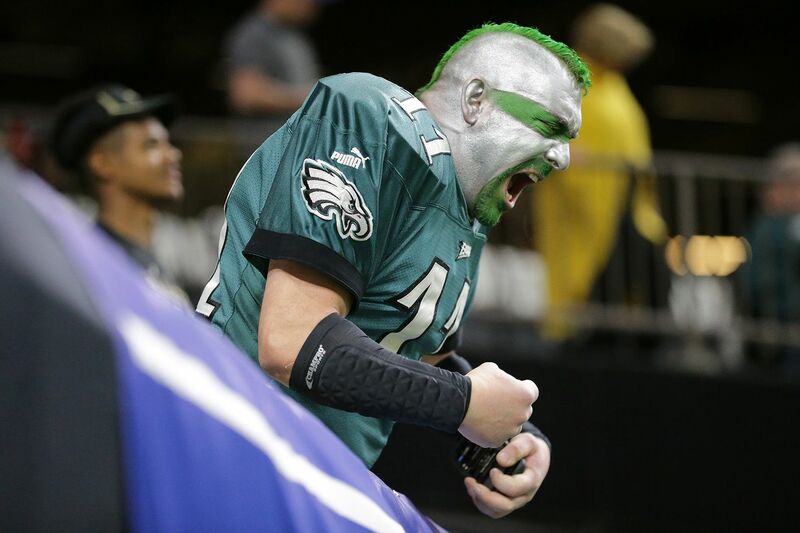 A Philadelphia Eagles fan gets fired up before the Eagles play the New Orleans Saints in the NFL Divisional Round playoff game on Sunday, Jan. 13, 2019 at the Mercedes-Benz Superdome in New Orleans, La. The Eagles lost 20-14, ending their season. It looks like the Eagles won’t be playing on Thanksgiving after all. Ahead of the NFL’s official release of the 2019 schedule Wednesday at 8 p.m., multiple outlets are reporting that the evening Thanksgiving game on NBC will feature the the New Orleans Saints taking on the Atlanta Falcons at 7:20 p.m. on Nov. 28, a rematch of last year’s Thanksgiving game. The Eagles will open up the 2019 against the Washington Redskins at 1 p.m. at Lincoln Financial Field on Sunday, Sept. 8. They’ll also play in five primetime games this season, beginning with their Week 2 match-up agains the Atlanta Falcons at Mercedes-Benz Stadium. Outside of the Eagles, we already know that the NFL will open the season with the Chicago Bears hosting the Green Bay Packers at Soldier Field on Thursday, Sept. 5, a nod to the league’s 100th anniversary. It’s the first time in six years the defending Super Bowl champion won’t host the first game of the season. Instead, the New England Patriots will open their season on Sunday Night Football at Gillette Stadium on Sept. 8 against the Pittsburgh Steelers. ESPN will air two Monday Night Football games to open the season on Sept. 9: Houston Texans at New Orleans Saints at 7:10 p.m., and Denver Broncos at Oakland Raiders at 10:20 p.m. The NFL is also switching things up with a pre-Christmas Saturday in Week 16 on Dec. 23 featuring three games on the NFL Network. The games are currently unscheduled, but the NFL said the three games will be chosen out of five possible match-ups: Houston Texans at Tampa Bay Buccaneers, Buffalo Bills at New England Patriots, Detroit Lions at Denver Broncos, Oakland Raiders at the Los Angeles Chargers and San Francisco 49ers at the Los Angeles Rams. The league said they’ll announce the three Saturday games no later than Week 8. The two that aren’t selected will take place on Sunday, Dec. 22. There will also be five international games played this year. Two will be played at the brand-new Tottenham Hotspur Stadium in North London, while the other two will be at Wembley Stadium. The fifth will be at Estadio Azteca in Mexico City, which hopefully learned from last year’s fiasco involving field conditions so terrible that it moved the Chiefs-Rams game at the last minute to Los Angeles.